A whiskey fruit punch does not get much easier than this while maintaining a full bouquet of flavors. Featuring Jim Beam's cherry-flavored bourbon, Red Stag, and created by Bobby "G" Gleason, this cocktail has a more sophisticated touch than the Red Stag lemonade for the simple fact that Champagne is one of its principal ingredients. It makes it a beautiful addition to any party and, the good news for you is that it's easy to prepare. The "fruit punch" of this recipe comes from a combination of Red Stag, strawberry liqueur, and passion fruit coulis. A coulis is a sauce made from a fruit or vegetable puree, just like this cranberry coulis, though passion fruit juice works perfectly and may make the punch a little easier. The punch is finished off with chilled Champagne in the glass. You should be able to get away with one standard bottle of wine for this recipe. However, if you really like your drinks to sparkle, it's a good idea to have a second one on hand so you can pour more into each glass. Pour the cherry whiskey, strawberry liqueur, and passion fruit into a punch bowl with large balls of ice. Have a bottle of Champagne on ice beside the punch bowl. To serve, ladle the mixture into Champagne flutes and top with Champagne. Garnish each glass with a strawberry or lemon twist on the rim. Gleason suggests an easy way to make ice balls: Fill balloons with water and suspend them from your freezer rack until frozen. This will result in more of a teardrop shape than a ball, but it's still very fun! Champagne may be recommended, but it's not required. 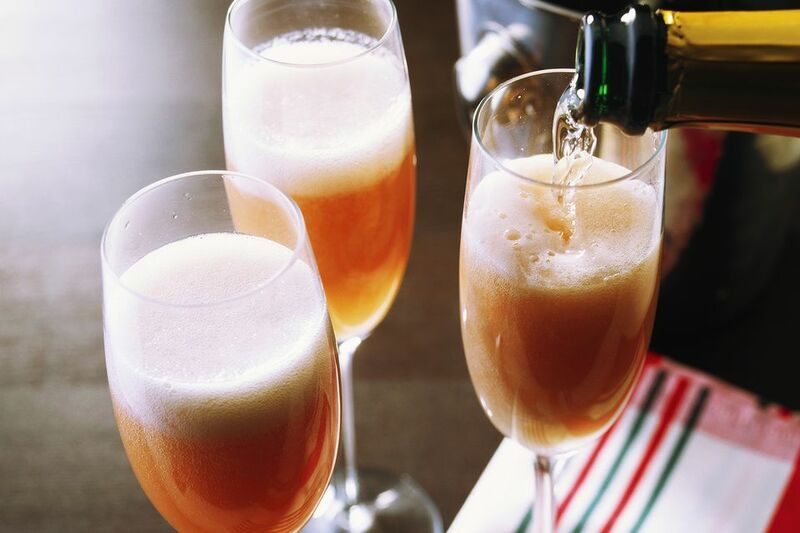 Pour any sparkling wine you like; you can often save money by going with Prosecco, Cava, or sparkling rosés. You can freeze a complementary juice into your ice balls and put that into the punch bowl. As it melts, the liquid will merge into the punch without watering it down. Try white grape, grapefruit, or pineapple juice. They'll each give the punch a fun twist. How Strong Is a Jim Beam Fruit Punch? The exact alcohol content each of your guests has in their glass is going to depend on how much punch and wine you pour. As a general estimate, the finished drink should fall somewhere in the 18 percent ABV (36 proof) range. That's stronger than a glass of wine and a little lighter than cocktails like the cosmopolitan. Keep that in mind because it is easy to drink a little too much.